Lawrence William Wilson was a member of the Ellerman Wilson shipping family. Living in Dover as a child he witnessed two ships fighting in the Channel in 1864 during the American War of Secession. He studied under N.E. Green and then later emigrated to New Zealand, settling in Auckland. He is subsequently recorded as being an artist in Oamaru, purchasing a farm in Canterbury and by 1884, being a Dunedin artist. He took pupils (including O'Keefe), became a painting companion of George O'Brien and shared a studio with Nerli. Painting in both oils and watercolours, L.W. 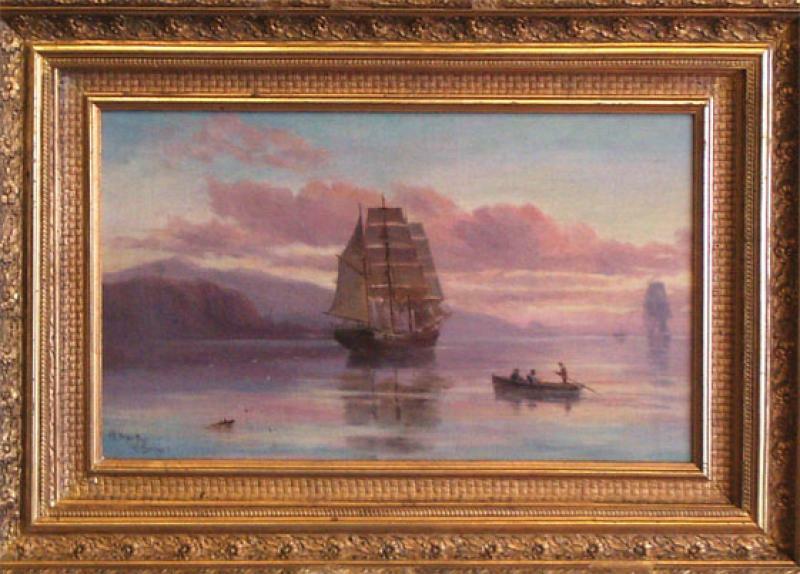 Wilson exhibited widely in New Zealand, including the CSA 1882 and OAS 1884-1904, as well as the St Louis Exposition 1904 as a New Zealand painter. In 1904, L.W. Wilson left New Zealand for Melbourne, where he spent five months on a commissioned painting of the city, before returning to England. L.W. Wilson is represented in major N.Z. galleries, Turnbull, Canterbury Museum, Hocken.